Where the action always is, some great moments capturing Max and his squeaky voice. Wednesday, June 30, 2010 marks Max's 9th birthday. I can't explain to those of you who have not lost a child how difficult it is to get beyond the loss. In fact, I don't ever try. Simply put: it's not the same as losing an adult. I find it particularly interesting how I think of Max every time I look at Hannah or Nicky. He is a part of them and they are a part of him, and will forever be intertwined. And the feeling of loss is compounded through them as I watch them grow, as I see their photos on the wall progress, as I see Max's stay the same. Forever 7. Through Hannah and Nic he is with us everyday. I am thankful for that. They smile, laugh and fight and I see Max there with them. It is bittersweet. This weekend we were at a friends' house for a birthday party and their 9-yr-old son, a friend of Max's, said to me, "Nicky has Max's eyes." Thank you for sharing that with me. Thank you for seeing it, too. I can't tell you where I am in spirit with one of my kids gone. I think I still float through the days, possibly avoiding it. Avoiding looking too long at any one photo. I think it's time for me to make a new pot of Tear Soup. I'm not sure I ever completed my first pot. I don't think I got the seasoning quite right. For Max's birthday this year, we will be enjoying crab claws. A favorite of Max's even when he didn't like food. We're going to make some paper airplanes and fly them away on the strings of some orange balloons. We invite you take part - where ever you are - in this celebration of a brave child's life on what would've been his 9th birthday, and to remember all the kids with NB who are fighting the fight, or have earned their wings. I concur and sign my name at the bottom of Andy's letter to Max (following). I miss my second child. We all miss him. I love you, Max. I remember, not long before you left us, asking if I could spoon with you while you fell asleep one night. You were terribly uncomfortable from all your meds and the cancer, but you needed some love, too. I will always remember lying next to you with the nightlight on, barely stroking your arm, and you falling asleep. You were so sweet, always. Happy Birthday in heaven. I bet God makes good cake. This is easily one of my favorite Max illustrations. All the red? Chaser bullets. Don't forget to catch the shark with the gun. Lost your first tooth (finally)! Started and finished 2nd grade. Started and finished 3rd grade (maybe Mrs. Sturt would have become a 3rd grade teach at the same time!). Convinced me to buy you a bunch of additional airplane models to hang from your ceiling (I know you know that we took some from your shelf and hung them in Nicky's room - he loves them as much as you do and now whispers in my ear on weekends if we can go to "the model store"). Watched every episode of Patton 360 with me on the History Channel. Built some really awesome Lego creations with Hannah, Nicky, mommy and me. Visited Legoland many times with Luke, or Jack, or some of your other friends. Watched all the episodes of The Clone Wars with your brother and sister. Continued to draw amazing pictures of whatever you thought was interesting. Continued to observe the world around you with the precision and detail of a scientist. You likely would not have enjoyed all the snow at Lake Tahoe the past two Christmas's, but thanks for sending a bunch for Hannah and Nicky to enjoy. Read Percy Jackson and the Olympians. Ran around in the backyard naked with your brother and sister when it was warm out. Started attending Sunday School regularly. Continued to grow and start to become a fine young man from the fine young boy you already were. There are so many things I would like to say to you Max. Maybe you can intercept my thoughts about you every day. Maybe when I say "hi" to your pictures on the wall or on the computer you can hear me. I hope so. I miss our conversations, I miss your questions. How much I ache to touch your almost porcelain-white skin again, hear your squeaky voice talk about battleships and WWII fighters again, see your smile. I know you're in heaven right now. And even though I didn't teach you much about heaven before you died, I know you went there immediately. You were the purest person I'll ever know. There was not one malicious fiber in your being. Not a bad thought about anyone - you wanted everyone to be happy, to feel loved, to have fun. Happy birthday my sweet boy! I will always love you. And I will see you again someday! Beautiful, sad, poignant, so filled with love and heartache. Max was such a special child in so many ways. I miss him everyday and share in your hurting and tears. I agree with you Andy! Max is the purest and sweetest boy! I cry with you all today. Buckets and buckets of tears here. As I discover my own pain grow, I cannot begin to fathom yours. Thank you for the video and art work of your perfect boy. The message to you Andy rips my heart out. And YES! I see Max's eyes in both Hannah and Nic. Happy birthday dear Max. Eternity will be a sweet reward for all of us, with you. Thank you for continuing to share Max. He is forever loved. Happy Birthday, Max! We celebrated your life here on beautiful Vancouver Island on Canada's west coast. My husband and I cooked crabs for the first time and laughed all night. I know you were smiling on us! I think of Max often. I began reading your blog about 6 months before his passing. I come here now and then and read new and old posts. Max really touched my heart all the way out here in NJ! 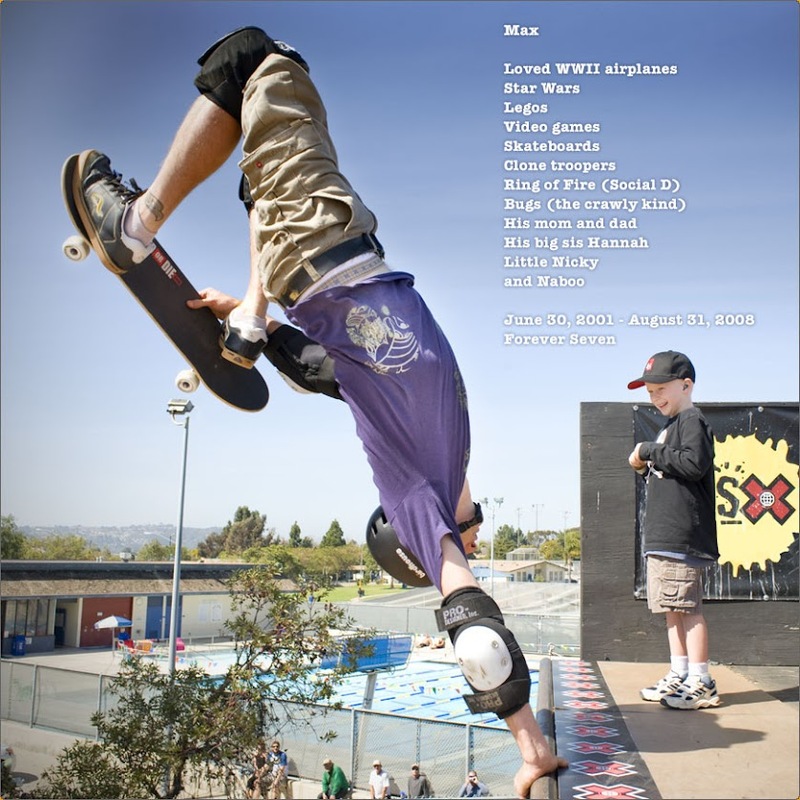 Been thinking a lot about Max today. Had to come here and get me a Max fix. Love you all! Thank you for sharing with us. When I read your blogs, I feel the love and pain from parents that had lose their child. May God bless you and family, and continue to give you strength and successes for your hard works to raise funding for the Pedi cancer research. God bless your hearts and love for the lil NB warriors. Touch-A-Truck Blew the Doors OFF!